The ebb and flow of the oceans from whence we evolved, if you believe that kind of stuff, are only the first, most basic example of a cycle, but when you stop and look around, practically everything in this world exists in a cycle of some sort. Even cities. Take Cleveland for example. Remember when it used to be a big deal on the American landscape? Not many people do, but back in 1950 the city had a population of almost one million people. Today that number stands at an anemic 396,815, a level not seen in the area since 1800. 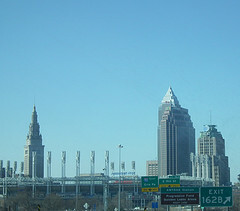 While Cleveland may still rock, the only rolling people seem to be doing is in their cars to get out of town for good. Interestingly, the entire metro still clocks in at a healthy 2.5 million, though, as the exodus loses a few people to the suburbs but perhaps even more to the exurbs. Check back with us in a hundred years and you’re liable to see a thriving metro area again. The real question is why do cities and real estate markets rise and fall with an almost metronomic rhythm? Why should you care? Well, if you happen to live in an area going through either side of the equation, there’s a good chance quality of life issues make you care a lot, but we’re talking about investing here and will endeavor to delve into the topic with a less emotional point of view. While there are dozens of reasons and hundreds of micro-reasons a city’s fortune may change, here are three of the primary ones. Major cities are dependent on what we call headquarter companies, and when (if) they leave with a trickle or all together, one should not expect the void to go unnoticed economically. While the financial health of a city might not be traced directly to these types of businesses, there’s no denying the fact they bring jobs and a certain amount of cachet. Like lemmings, when one decides to put down roots in a particular area, another is likely to follow. Then another…and another. Suddenly you have more people moving into the area in search of these new jobs, which triggers a more vibrant real estate market as the demand for rentals and home purchases is driven ever higher. Going beyond the presence of national or international headquarters, we find that industry (including technology) is another important component of a city’s wealth cycle. Though the industrial revolution has long since shifted from American shores to second and third world countries with cheaper labor, large manufacturing firms still play an important part in the urban landscape. The arrival of a new plant is usually heralded with great fanfare by city leaders. Likewise, the departure of the same often precipitates much wailing and gnashing of teeth. Well, maybe not EXACTLY that but you get the picture. It can be traumatic. These days it seems like everyone and their great uncle Fred is going back to school. With the cost and perceived long term value of a two or four-year degree perhaps higher than ever, is it any surprise that the preponderance of colleges, universities, and even vocational and tech schools has a lot to do with the local economy? Once again, schools mean jobs, but also a way up and out from unsatisfactory personal economic circumstances. To be plain, people will always want to improve themselves and education is still seen as a viable way to accomplish that. Ergo, if you want to give your city a shot of vitality, open some institutions of higher education! Here’s what we mean. Everyone here familiar with Pittsburgh, synonymous with steel production? Heck, they even named their football team after the industry. As the steel industry declined and fell, departing for foreign shores, the city entered what could politely be termed a “free fall.” Recent years have seen a stabilization and even increase of economic activity. Why? Education! As an investor, you should be beginning to see the value of all this micro and macro economic mumbo jumbo. An enterprising soul with a trained eye and money to spend just might be able to spot a city on the upswing and adjust his portfolio accordingly. Don’t worry about picking real estate market tops and bottoms. It’s not necessary. Plenty of people have generated enormous amounts of wealth on the in between.